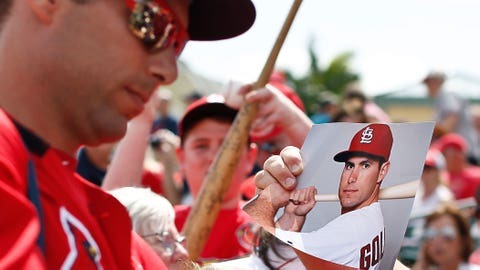 Cardinals fans are excited about the addition of first baseman Paul Goldschmidt. Welcome to St. Louis, Paul Goldschmidt and Andrew Miller. The longtime Diamondbacks slugger arrived in one of the marquee trades of the offseason, and one of the top relievers in baseball came to town as a free agent. 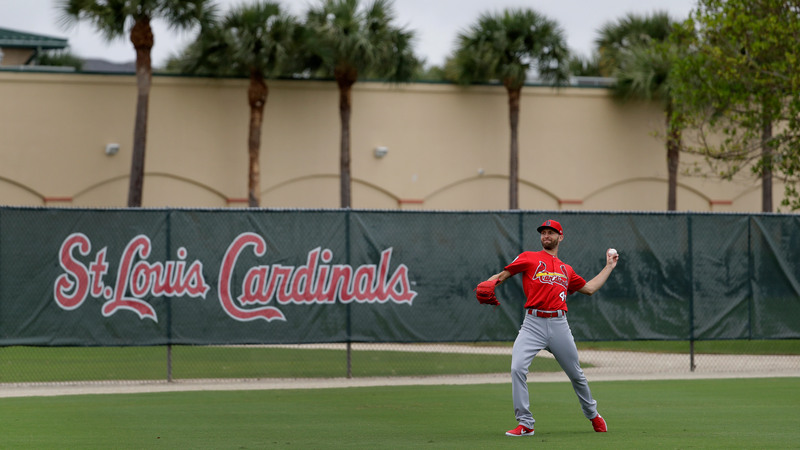 Together with a returning core that made huge strides under skipper Mike Shildt, the Cardinals believe they have the pieces to contend with the Chicago Cubs and Milwaukee Brewers in what should be a stacked National League Central. Goldschmidt got off to a slow start last season but went on a tear in June, and he wound up with the same kind of consistently stellar numbers that he always put up with the Diamondbacks. He joins a lineup that includes infielder Matt Carpenter, catcher Yadier Molina, left fielder Marcell Ozuna and shortstop Paul DeJong, who combined for 98 homers last season. The Cardinals have the ability to score plenty of runs with very few swings of the bat. The starting rotation took a hit this spring when Carlos Martínez experienced shoulder trouble that will place him on the injured list when the season begins. But with Miles Mikolas coming off a breakout year, Jack Flaherty posting huge strikeout numbers as a rookie and veterans in Michael Wacha and Adam Wainwright, there is enough depth in the starting rotation to keep the Cardinals in games. There are plenty of questions, of course. Will outfielder Dexter Fowler bounce back from a brutal 2018 season, especially after a less-than-inspiring spring? Can the young arms live up to the hype? Will the Cardinals continue to respond to Shildt now that he’s in charge for a full season? Ozuna arrived in St. Louis on the heels of back-to-back All-Star selections, but he produced a solid if unspectacular season. He hit .280 with 23 homers and 88 RBIs, but they weren’t near the 37 homers and 124 RBIs he produced in his final season in Miami. One of the unsung heroes of last year’s run was Flaherty, who struck out 29 percent of opposing batters. The only other rookies to log those kinds of numbers have been Dwight Gooden (1984), Hideo Nomo (1995) and Kerry Wood (1998). Now, can the 23-year-old Flaherty translate those numbers into wins? He was 8-9 with a 3.34 ERA in 28 starts last season. Goldschmidt and Miller are a pretty good place to start. Both will shoulder huge expectations, a byproduct of their track records of success. The 34-year-old Miller was an All-Star two years ago in Cleveland, though he had a 4.24 ERA in 37 appearances last season. Keep an eye on right-hander Dakota Hudson, who was solid in relief last season (2.63 ERA in 27 1/3 innings) and appears to have a bead on the fifth spot in the rotation. Otherwise, his solid ability to induce ground balls will continue to play well out of the bullpen.